In an election season where the candidates can’t seem to agree on anything, opposition to free trade has become a rare point of commonality. But repealing trade is unlikely to restore the manufacturing jobs that have been lost over the past two decades. There’s been no shortage of orthodoxies broken during the 2016 election cycle, but perhaps the most surprising, and thoroughgoing, has been the emergence of strong anti-trade rhetoric on both the left and the right. Republican nominee Donald Trump has made re-negotiating bad trade deals a centerpiece of his campaign and, in the process, seems to have brought about a seismic shift in Republican sentiment on trade. Just a month before he announced his candidacy, only 39 percent of Republicans said that free trade agreements have been a bad thing, according to a Pew Research poll. As of mid-August, that figure has risen to 61 percent. Democrats remain, on the whole, more sanguine about free trade — 58 percent say that free trade has been good for America — but Senator Bernie Sanders’s remarkable success during the primaries, and his highly vocal opposition to expanding free trade, has left the Democratic nominee, Hillary Clinton, in the awkward position of decrying a trade deal, the Trans-Pacific Partnership (TPP), that she championed as secretary of state. The unanimity between the candidates is all the more remarkable as there has been consensus amongst economists for decades that free trade, on the whole, promotes economic growth — though this consensus, too, is beginning to show signs of wear. Some economists, including Columbia Business School’s Joseph Stiglitz, have grown increasingly wary of trade deals as they’ve moved from lowering tariffs to primarily addressing non-tariff trade barriers. Non-tariff barriers, commonly called NTBs, consist of anything other than a direct tax that adds cost to trade, ranging from things like the United States’ use of the imperial, rather than the metric system, necessitating different labeling and packaging for goods, to bans on the import of toys painted with lead paint, for example. While there can be economic benefit to standardizing regulations, some have expressed concern that agreements like the TPP could be used to undermine attempts to protect the environment or public health. These critics point to cases like Philip Morris v. Uruguay, in which the cigarette manufacturer attempted to invalidate Uruguay’s plain packaging laws under the terms of a 1988 bilateral investment treaty with Switzerland. From March 1, 2010 Uruguay began requiring that health warnings cover at least 80 percent of the packaging for all cigarettes sold in the country. To overturn the rule, Philip Morris took Uruguay to court, arguing that the law reduced the value of their logos, damaging the company’s intellectual property, which was protected under the terms of the 1988 trade agreement. Philip Morris lost that case this summer, but others have been more successful, like Metalclad, an American waste management company, which won a $16.7 million expropriation settlement against Mexico after the country declared a nature reserve in an area that the company sought to turn into a landfill. The campaigns this season, however, have largely eschewed these complexities. Instead, the candidates have focused nearly exclusively on restoring American manufacturing — and pointing the finger at China — which, notably, is not party to the TPP negotiations. 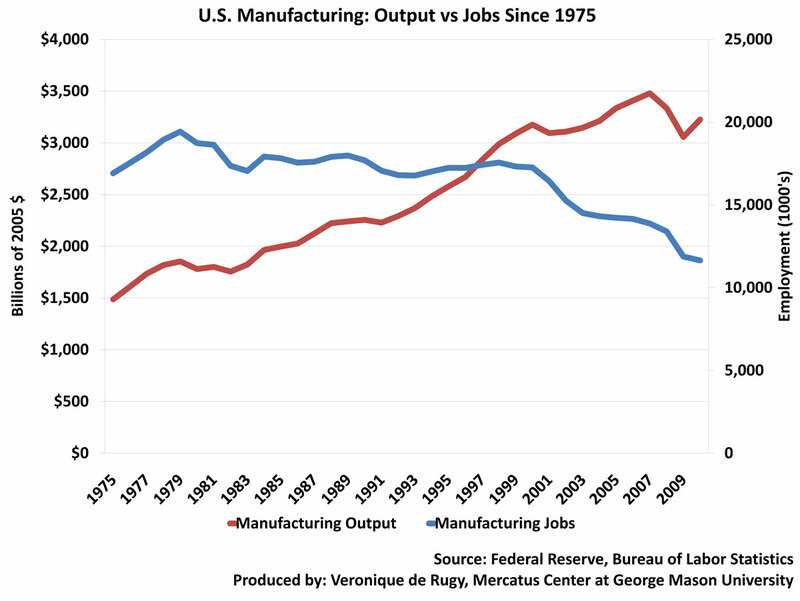 While economic research has shown that trade with low-wage countries has played a role in manufacturing job declines in the United States, that’s only part of the story. Just as significant has been the expansion of automation in manufacturing and the resultant productivity boom. Even without the rise of the machines, however, Amit Khandelwal says “it’s not obvious that increasing trade barriers or somehow retrenching from the global economy would suddenly bring those jobs back.” Khandelwal, director of the Jerome A. Chazen Institute for Global Business at Columbia Business School and an expert in international trade, points out that the way business is done today is very different from the way it was done 40 years ago, when manufacturing employment peaked. Where once an American car might have been produced entirely, or nearly, from parts manufactured exclusively in and around Detroit, final assembly is generally conducted near the ultimate site of sale (either in the US, or in Canada or Mexico for cars destined to be sold here) to save on transit costs, but parts can come from virtually anywhere. Indeed, a component can crisscross the globe multiple times, being improved and added to, before it’s included in a final assembled product. It also explains why simply raising tariffs is likely to only increase prices for consumers. While one might be tempted to believe that a blanket increase in import duties — like the 45 percent tariff on Chinese imports proposed by Trump — would incentivize companies to return to entirely domestic production, with standards of living around the world rising rapidly, access to foreign markets can be just as important to a domestic firm’s long-term success as the American market. Professor Khandelwal teaches an elective course on International Business. His research interests examine issues in international and development economics, including the strategic response of firms to trade liberalizations and increased international competition.